Previous owners at 5490 Calumet Avenue in La Jolla were more interested in mortgage fraud than ocean views. How about an opportunity to own a nearly-new oceanfront estate in south La Jolla for less than half the original asking price? The home at 5490 Calumet Avenue sits just two doors north of Calumet Park in Bird Rock, boasting 140 feet of private ocean frontage. With just under 5900 square feet of indoor living area, the 2008-built residence has five bedrooms, six baths, and sits on a quarter-acre lot. “Once you open the front door you are wowed by the breathtaking ocean views enjoyed through the disappearing glass doors and most main living areas,” listing materials promise. Downstairs, there’s an “impressive great room” occupying nearly 700 square feet of space on its own (more than many local one-bedroom apartments), a “gourmet kitchen with built-in high-end appliances” and “beautiful quartzite countertops,” and an “oversize chef’s island for entertaining,” along with one of the home’s two master suites. A “gracious, elegant staircase escorts you the second floor,” where one finds three more en-suite bedrooms and a second laundry room to complement its first-floor counterpart, along with an office-slash-optional sixth bedroom and a second master boasting “custom doors that opens to the oversize balcony overlooking Pacific Ocean, surf and sounds” along with dual walk-in closets and a custom bath with separate shower and soaking tub. Outside, newly-installed minimalist landscaping tapers along the bluffs to the ocean below, while a large concrete slab patio surrounds the “rare oceanfront pool and spa,” providing outdoor entertainment opportunities with a second kitchen with built-in barbecue. Though it appears the home may never have been lived in, the listing nonetheless states it’s recently been completely remodeled, “with designer selected custom features and accents throughout,” along with new carpet, paint, “designer light fixtures,” TVs and electronics, and new central air conditioning and security systems. The Calumet property has been plagued with problems since the original house, a 1952 ranch-style, was purchased by investors for $3,250,000 and razed in 2002. Plans were drawn for the current residence and the vacant lot was sold twice in quick succession in 2007, first for $4,950,000 and again for $5,475,000 later in the year. At the time, many Americans were recognizing signs that the housing market was beginning to weaken, having peaked a year prior. The bursting of a housing bubble that would usher in the Great Recession, however, would not be felt in the luxury market for another year or two. Don't think of it as spending $12 million, think of it as saving more than $12 million of the original price tag. Meanwhile, construction began and in February 2009 the finished, state-of-the-art Calumet mansion was listed for $24,500,000. It sat on the market for nearly a year before the listing was canceled. Immediately re-listed with a drastically reduced price tag of $16-18 million, the home still drew no buyers despite spending an additional 560 days on the market. Prices had begun to stabilize along the real estate ladder’s lower rungs, but the investors snapping up entry-level homes for rentals were less interested in the ultra-luxury market, which was in free-fall. By 2012 the price had dropped to as low as $13.5 million, but there were still no takers. An attempt by the two investor-owners, San Diego-based Thomas Wagner and Jon Prusmack of New York, to sell the property at auction also tanked. The pair finally offloaded the property in 2014 for just $13 million. The buyers didn’t appear interested in enjoying the home’s scenic vistas or lavish amenities, however. 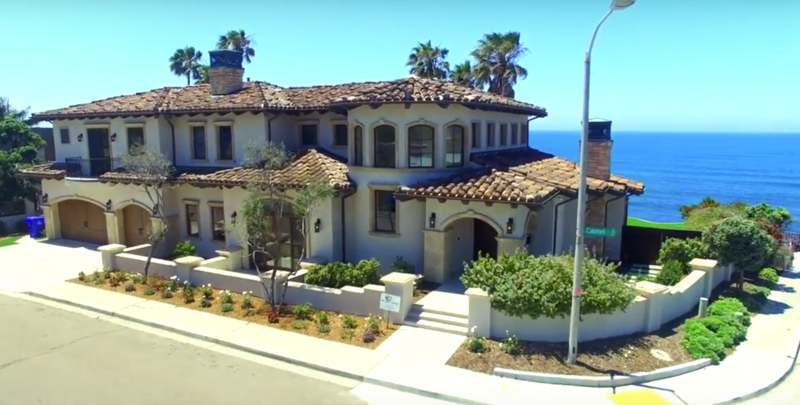 Last year, investment executive Peter Cash Doye and local real estate broker Raquel Reid were accused of perpetuating a multimillion-dollar mortgage fraud involving several properties in La Jolla and Del Mar. Doye’s business partner Courtland Gettel, who has already pleaded guilty, signed the trust deed securing at least one of the loans that resulted in the group pulling nearly $19 million out of the house they’d paid just $13 million for. In June 2017 the primary lender, who had originally funded $13.5 million to the group and was by then owed over $18 million including unpaid interest and legal fees, acquired title to the property through a trustee’s sale. After completing updates to make the brand-new (yet 10-year-old) home appealing to luxury buyers, the property was re-listed in early April for just $11,998,000, a price that remains unchanged to date.